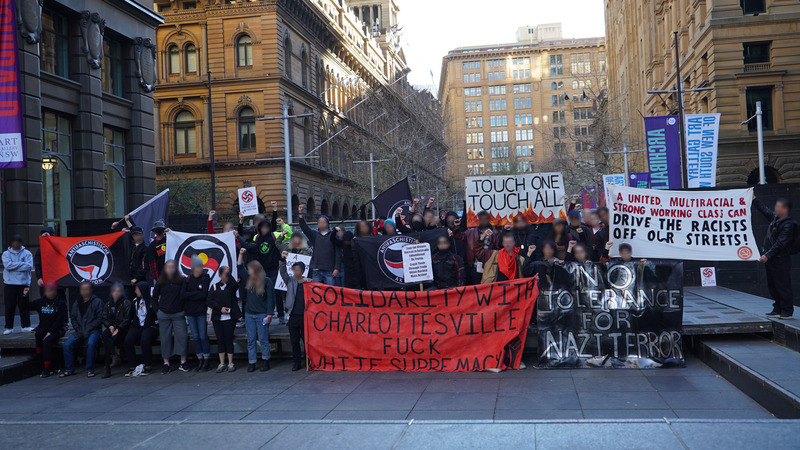 Along with comrades in Charlottesville and around the Southeast, we are calling for a weekend of international solidarity for August 11-12, 2018 to celebrate the courage and sacrifice of those who fought the rise of fascism in Charlottesville last summer. This is an important time to renew the visibility of the struggle for real freedom and equality. 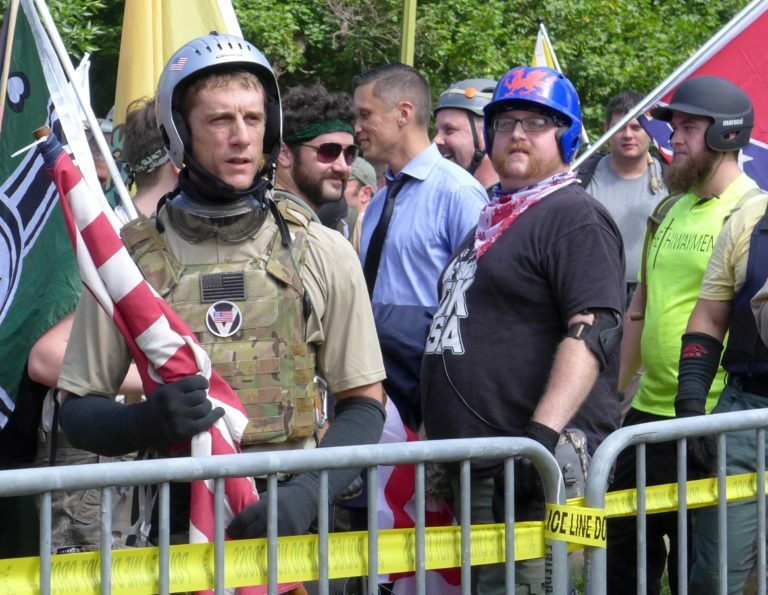 The organizers of last summer’s far-right fiasco are attempting to organize “Unite the Right 2” rallies in Charlottesville and/or Washington, DC. While many in the Virginia area prepare to confront them, we invite you to join us in organizing local actions to spread the fight to every corner of the globe. A Call to Action to the Charlottesville Resistance of August 2018. 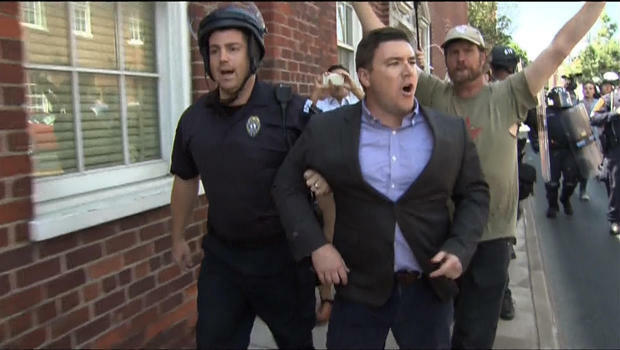 Image above: Unite the Right organizer Jason Kessler was chased out of Charlottesville last year. A fascist who attended at the fascist Patriot Prayer rally in Vancouver, Washington attempted twice to run over antifa counter protesters with his truck yesterday. The driver, Billy Wilson, was briefly detained, but later released without charges. Earlier there were skirmishes during a fascist rally in Portland, Oregon. 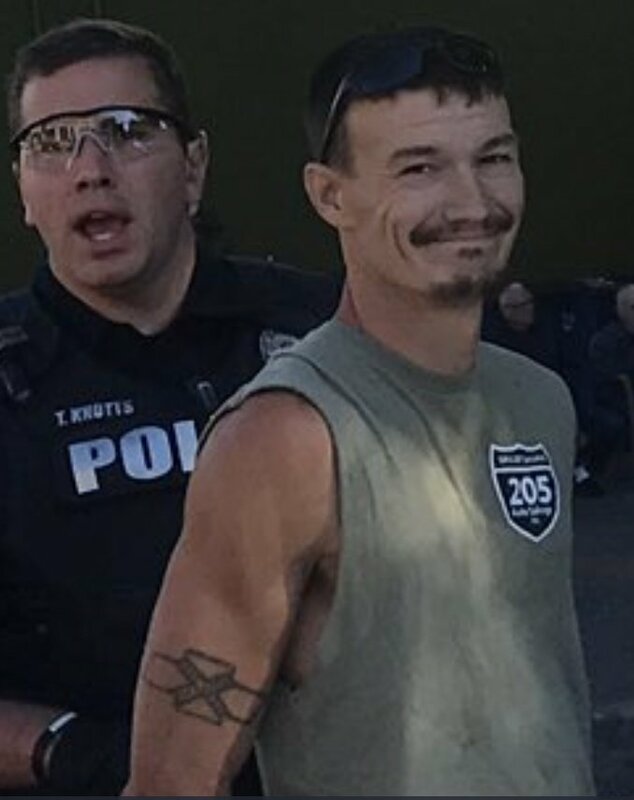 Image: Billy Wilson attempted twice to run over antifa counter protesters with his truck in Vancouver, WA on September 10. As our readers are no doubt aware, this “Unite the Right Rally” was a disaster for the Alt-Right and led to the death of Anti-Racist demonstrator Heather Heyer as well as multiple hate crimes and assaults by Neo-Nazi and Far Right rally participants. In the fallout, many of the rallies participants and organizers have turned on each other and/or distanced themselves from the Alt-Right. Statement from September 2 by the Greek Anarchist Federation. In Charlottesville, Virginia 32 year old anti-racist Heather Heyer was run down with a car at an anti-fascist protest on August 12. This murder by a white supremacist touched off a fury of democratic rhetoric by the very political forces that have cultivated this political violence for decades. What happens when folks follow the advice of hand-wringing liberals and ignore Nazis? What happens when militant antifa forces do no present themselves to repel Nazis from rallying in public spaces? The Nazis feel empowered to brutally assault anyone who objects to their genocidal fantasies, as was shown in Charlottesville the night before a Nazi murdered Heather Heyer. 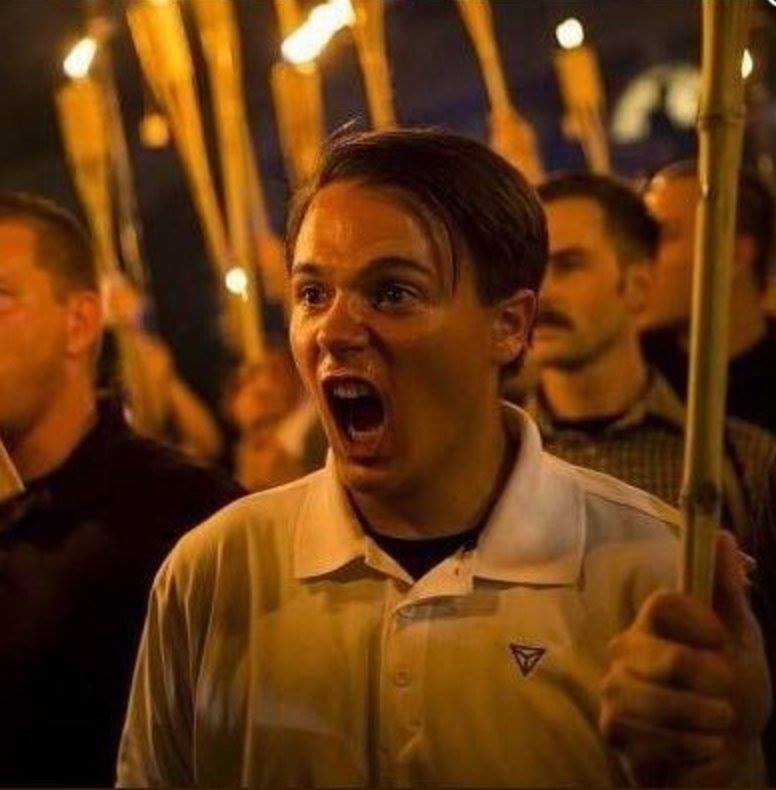 On August 11, 2017, a horde of Nazis with tiki torches expressed their “free speech” rights by chanting Nazi slogans, then proceeded to surround and viciously attack a small group of University of Virginia students brave enough to counter-protest Nazi hate. 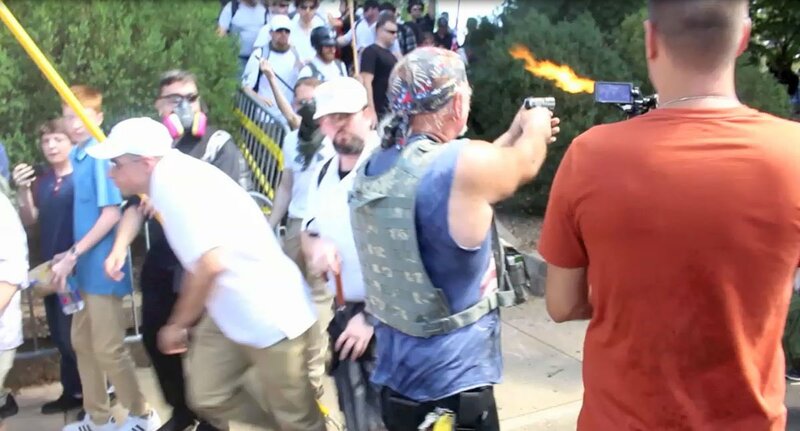 During the fascist Unite the Right rally in Charlottesville, where a fascist attacked counter protesters with a car on August 12, another fascist pulled a gun and fired on antifa protesters with live ammo. 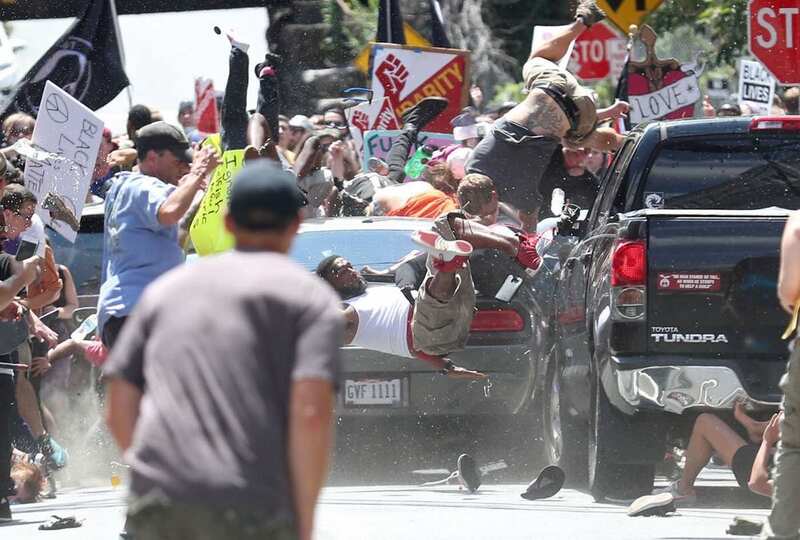 Heather Heyer was killed and at least 20 protesters were injured during the car attack, but moch more people could have been killed. The police did not interfere, but now arrested KKK grand wizard Richard Preston. 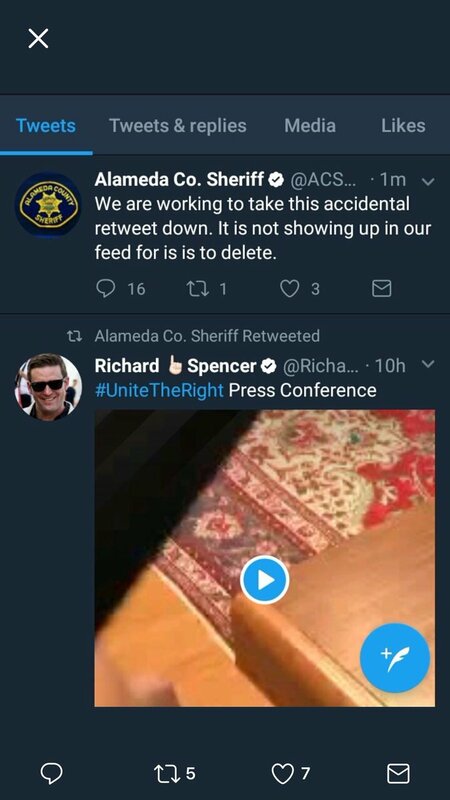 On the night of August 14 (two days after Heather Heyer was murdered in Charlottesville) at around 10:40pm, the official Twitter account of the Alameda County (California) Sheriff’s Office (ACSO) retweeted a video of a press conference organized by Richard Spencer, the icon of the white supremacist “alt-right” movement. The retweet dubbed the press conference with a “Unite the Right” hashtag — the same slogan that white supremacist groups used to mobilize people to Charlottesville, VA, which resulted in the tragic murder of an anti-racist demonstrator by a white supremacist. Screenshot of the Tweet by Alameda County (California) Sheriff’s Office (ACSO) @ACSOSheriffs. The Retweet of Richard Spencer’s tweet was deleted after a shitstorm. 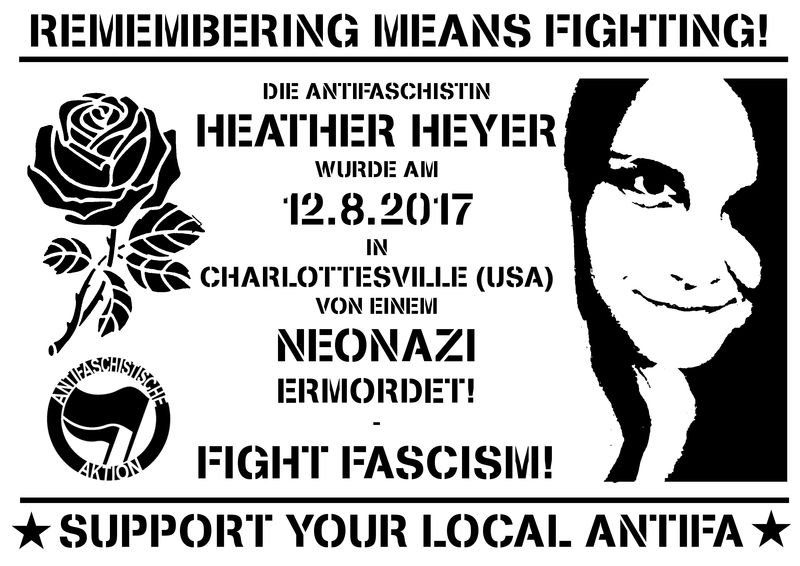 On Friday August 18, activists from Hameln, Germany did an action to commemorate Heather Heyer and show solidarity to all antifascists.